Sovereign immunity can add to the value of patents owned by state universities, but it is not an ironclad defense against patent challenges — at least not until we hear more from the courts, an attorney cautions. Go ahead and promote sovereign immunity as an extra bit of insurance to potential licensees if you want, but don’t make promises that the patent is safe from legal action, says Paula Estrada de Martin, PhD, JD, a life sciences and biotechnology patent attorney with the law firm of Baker Donelson in New Orleans. The issue of sovereign immunity has been tested three times in 2017, in cases involving the University of Florida, the University of Maryland, and the University of Minnesota. In each case, the Patent Trial and Appeal Board ruled that these state schools were immune from IPR proceedings challenging their patents based on the 11th Amendment of the U.S. Constitution. The cases are now giving rise to cases that push the boundaries of sovereign immunity, including the sale of patents to American Indian tribes, who then license the patents back to large pharma companies for cash and protect the companies from IPR challenges via their sovereign immunity. The first such case involves IPRs filed by Mylan Pharmaceuticals against six patents that were owned by Allergan at the time of the filing. In September Allergan assigned the patents to the Saint Regis Mohawk Tribe, which granted back to Allergan an exclusive limited field-of-use license and then notified the Board that it was the new owner of the patents. A week later the Saint Regis Tribe filed a motion to dismiss based on tribal sovereign immunity. Another case with more direct impact on universities also appears to be stretching the limits of a sovereign immunity defense, Estrada de Martin says. Unlike the other cases involving IPR challenges, Ali v. Carnegie Institution of Washington pits a researcher who claims he was improperly omitted as a co-inventor seeking damages. The suit has been dismissed by the courts thus far on sovereign immunity grounds, but the researcher has petitioned to the U.S. Supreme Court. The Ali dispute involves a graduate student’s work at the University of Massachusetts regarding mRNA inhibitors. The researcher he worked with, Craig Mello, was awarded the Nobel Prize along with a colleague from Carnegie, and several related patents are owned jointly by the universities. The graduate student was not listed as an inventor and sued the schools. A court dismissed the University of Massachusetts on grounds of sovereign immunity, and Carnegie was also dismissed because the University of Massachusetts was deemed an indispensable party to the litigation. The plaintiff is petitioning the Supreme Court, but Estrada de Martin says sovereign immunity is “a smokescreen” for the real issues in the case, and it is not the right test case for the question of state schools being immune from patent challenges. Some tech transfer officials look at the Ali case and go too far in their conclusions about what it means for patents at state universities, she says. Universities would be better off focusing on clearly defining policies on crediting inventors and determining inventorship, she comments. Estrada de Martin also points out that sovereign immunity decisions made by PTAB have limited impact on future matters, since they do not involve potentially precedential court rulings. 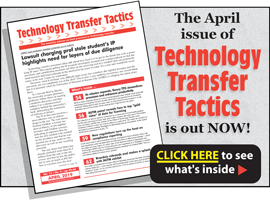 A detailed article on the status of sovereign immunity for public universities appears in the December issue of Technology Transfer Tactics. To subscribe and get the full article, plus hundreds of best practices and success strategies for TTOs in the publication’s online archive, CLICK HERE.